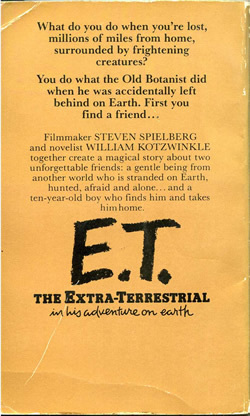 There are a few E.T. books on the shelf from back in the day as well. The first, I think, came from that same supermarket book rack where I picked up the three A-Team books. Published in 1982, this book was significantly above my first grade reading level -- but I didn't care. It said E.T. so I wanted it. I'm not quite sure how I got it though. 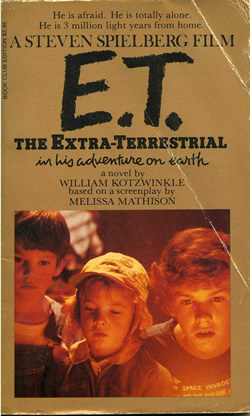 Either I had an extra $2.95 in my six-year-old budget (which is highly unlikely considering the arcade game/juke box demand of the time) or I was able to convince my parents that this book was worth three bucks just because it was something E.T. related. Either way, I got it. Despite the bent cover, this book has never been read. 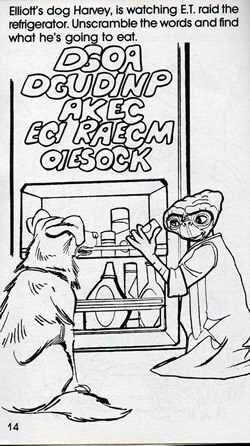 Then there's the E.T. Games and Activities book. This likely came from a school-sponsored book order and is much more in line with my reading and ability level of the time. 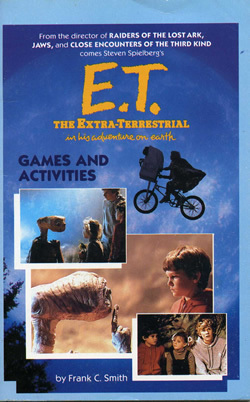 For $1.95, I got roughly 50 pages of E.T. entertainment. Much like the A-Team activity book, many of these puzzles could be completed by a small rock with a pencil. At the same time though, there are a handful of activities in this book that seem so tedious and detailed that even today, in my 30's, I don't want to bother taking the time to complete them. 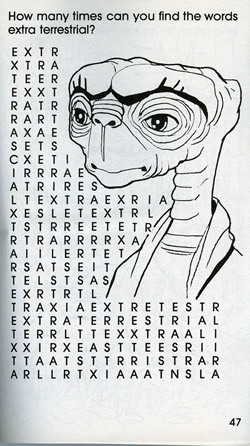 Here are a few examples of the easier puzzles -- although, I'm pretty sure it wasn't soda that E.T. was throwing back when he raided the fridge. With only about a quarter of the pages in this book having any marks on them at all, I had to laugh at one of the puzzles that was "completed." Looks like I spent a lot of time on this one. A few years ago I read the book sequel to the movie. 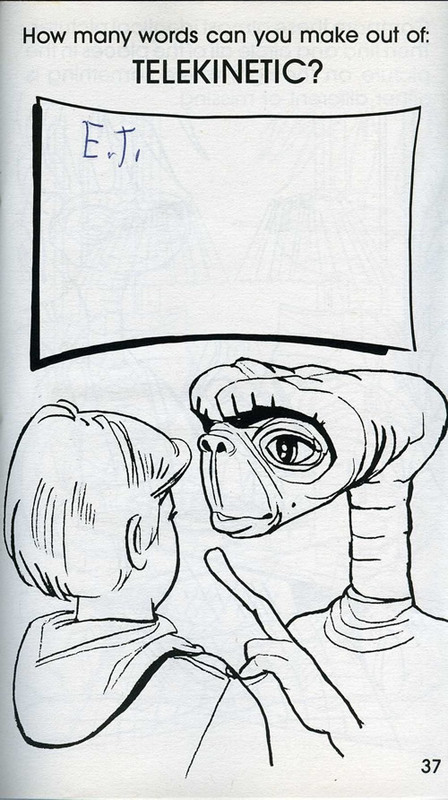 It's called E.T. 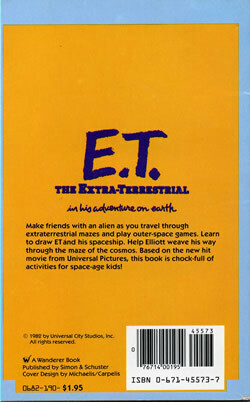 : The Book of the Green Planet and it's about E.T. going back to his home planet and how he gets on after life on earth. While it's aimed at younger reader it's still an interesting read if you're a fan of the movie. I saw that book on Amazon a few days ago and wondered what it was. I'll have to check that out sometime. I am sure you would have found just as many words out of "telekinetic" if you had used an internet anagram maker as a kid.